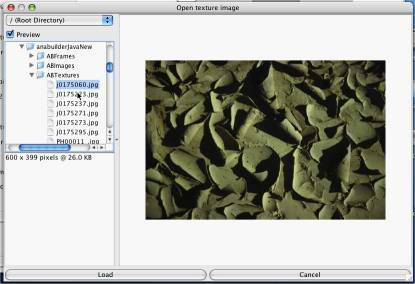 Open AnaBuilder, and drag & drop the image file to open it. 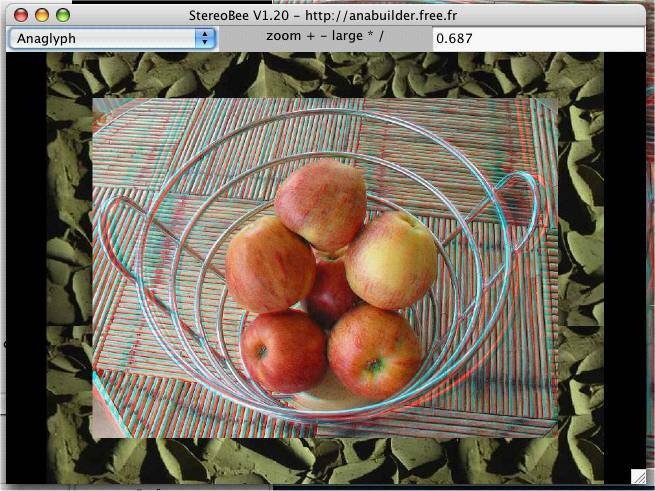 You should get a stereo anaglyph in AnaBuilder's main panel. 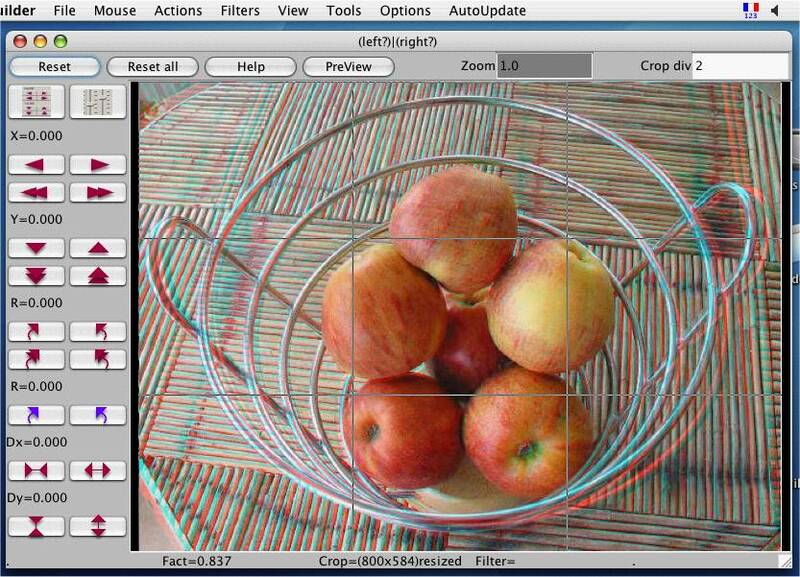 You should get a stereo anaglyph in AnaBuilder's main panel. Ouvrir AnaBuilder, et tirer & lâcher le fichier image pour l'ouvrir. Vous devez obtenir une stereo anaglyphe dans le panneau principal d'AnaBuilder. Vous devez obtenir une stereo anaglyphe dans le panneau principal d'AnaBuilder. 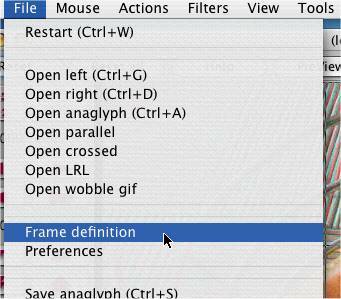 Open the Frame definition tool. Enter border width : "Border % = 10" so that the created border will be 10% of the image size. Click on the "Texture" checkbox, so that this border will not be a single color, but a texture. Then, click on the button at right containing a display of the current texture, and select the first texture in the texture browser. Click 1 time on the "fast move to left" button ( ) to add a small depth effect. Then, go back to the border panel and click the "Default" button at bottom to reset all definitions. 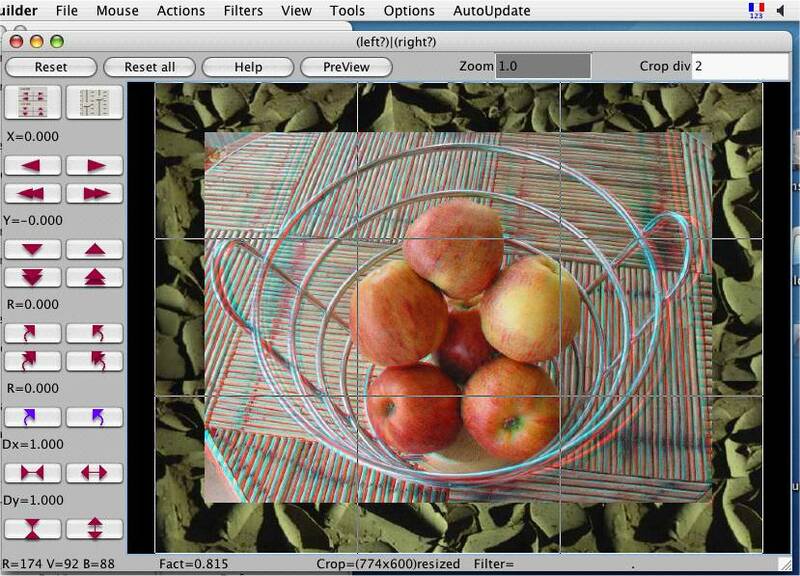 Now, enter border width : "Border % = 3" so that the created border will be 3% of the image size. Then, click on the button at right containing a display of the current color, and select a dark green in the color browser. Enter border width : "Border pix 2 = 2" so that the created border will be of 2 pixels. 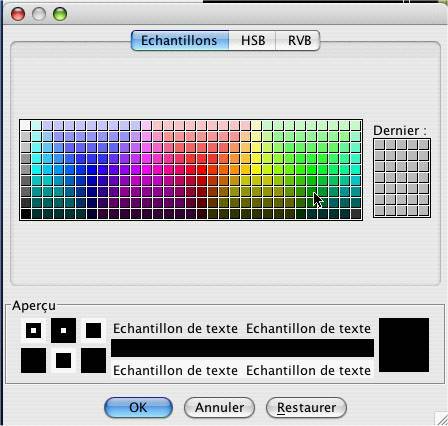 Then, click on the button at right containing a display of the current color, and select light green in the color browser. As this stereo is a bit red and green, it is not really comfortable to view as anaglyph. 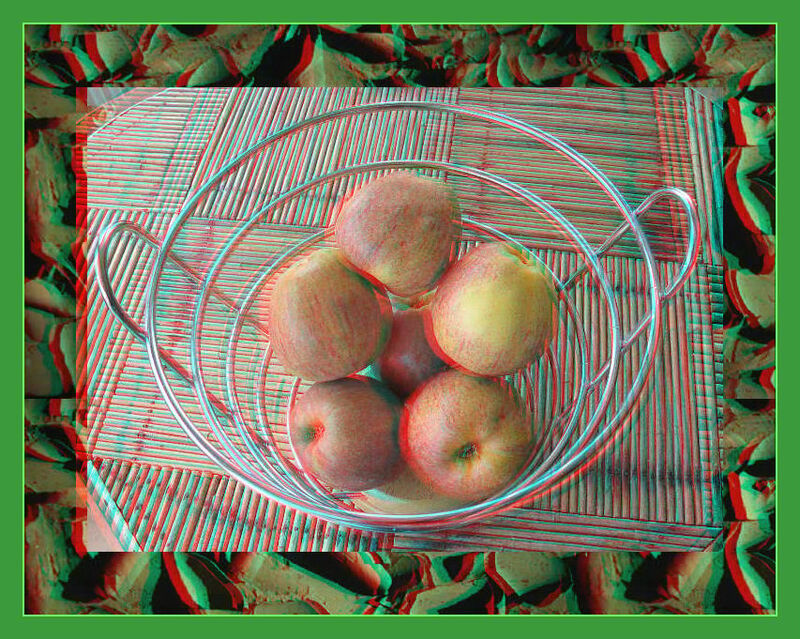 If you would like to build a better anaglyph you should desaturate it. Validate the framing as at the beginning of section 3, updating the working image. 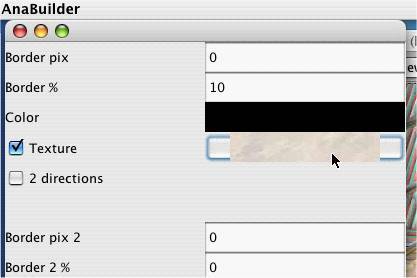 After this validation, on the border panel, also click on the "Default" button to reset all values, to avoid adding twice the frame at the saving step. 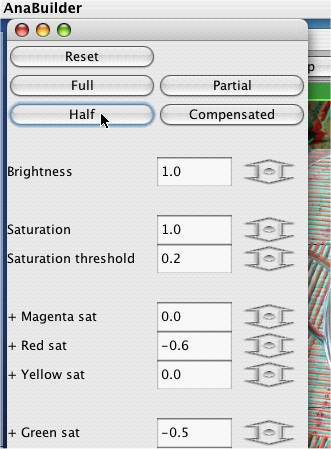 Now clik on the menu "Filters / Sat6 filter", and choose a preset filtering configuration, for example "Half". 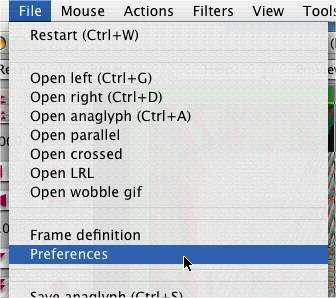 To get a much better anaglyph, open the Preferences panel and check the better quality checkboxes. Also set a JPG compression rate depending on the file size you want. Ask to save as anglyph, and give a name.